Liverpool manager Jurgen Klopp will not listen to any bids for Philippe Coutinho, saying: "We are not a selling club." The Brazilian playmaker has been linked with a move to Barcelona, with the Spanish giants understood to have bid £72million for him. Coutinho is arguably the Reds' most important creative force and Klopp was adamant that the club have never, and will never, invite interest in the player. Asked if the 25-year-old was not for sale, Klopp told a press conference in Hong Kong on Friday: "Yes, that's what we can say. But that's not since this morning or yesterday, I'm not sure if it was different at any time. So, yes. "I'm not surprised that any club is interested in players, if it is like this. A few people obviously see that Liverpool has a few good players. That's how it is. "But a very important message, maybe - we are not a selling club. Liverpool are more focused on recruiting players to help them improve on last season's fourth-placed finish in the Premier League. Egyptian forward Mohamed Salah has been brought in from Roma, while the Merseyside club are also interested in RB Leipzig midfielder Naby Keita. 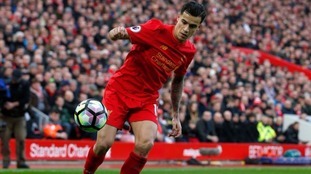 Klopp is determined to add greater depth to his squad after admitting they relied too heavily on Coutinho last season and struggled in his absence. "Phil is a very, very important player but we need to react better when he's not on the pitch, that's how it is," the German said. "He was out for a few games (last season) and then he came back and was not in the best shape. He tried to get his rhythm back. With his quality he has the opportunity under pressure to be on the pitch. Other players, you keep in training. "But Phil, when he is able to run properly you want to have him on the pitch again. So we have to be better even in moments like this."